This type can be dated from 1580 - approximately 1620. Most of the time the bowl isn't burnished and doesn't have a milling around the rim. This type is characterised by a rim that is formed by a single horizontal knife cut. Unmarked clay tobacco pipes are much more common than marked pipes. Fully decorated tobacco pipes are rare. The only fully decorated first generation Dutch clay tobacco pipe that is known is decorated with a fish with an open mouth. From 1610 the first generation tobacco pipe evaluates into the bi-conical type. Clay tobacco pipes from this type are bottered (the rim has been smoothed with a bottering tool giving a rounded profile). Both burnished and untreated bowls were produced. Unmarked clay tobacco pipes are still more common than marked clay tobacco pipes. Fully decorated tobacco pipes were introduced from approximately 1625. Most popular were the so called Jonah pipes with the prophet Jonah on the bowl and the whale decorated on the stem. 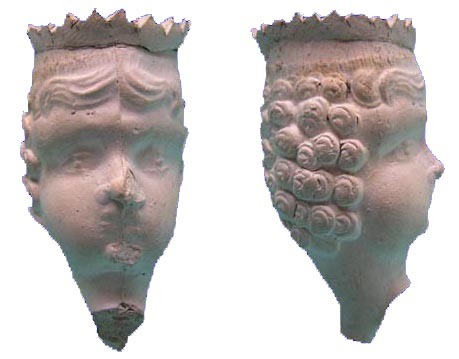 The bi-conical type was - especially in less prominent clay tobacco pipe centres like Groningen en Leiden - used until the last quarter of the 17th century. In the mid of the 17th century the bi-conical type evaluates especially in Gouda into the funnel type. This type was in production until approximately 1730/1740. This type of clay tobacco pipe is always bottered. 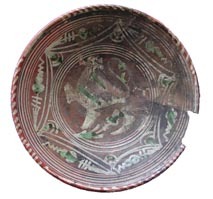 Marked, burnished and untreated bowls were produced and are known. Although heelless pipes were produced on a small scale in 17th century Amsterdam it became much more popular from 1730 and onwards. This kind of pipe has never reached the popularity of the ovoid pipe. However, this type op pipe has been in production until far into the 20th century. Most of the time this type of pipe is marked. Especially for the export to compete against English clay tobacco pipes, the hooked bowl type was introduced in Gouda around 1730. In the mid of the 19th century new impulses to this type of model was given by the introduction of the Isabé/Izabé model. Oostveen, J. van en A. van Oostveen-Bonnema, 2001. Kleipijpen; Een statistische analyse. In: Westerheem, p.13-25.